This page is your one-stop shop for information regarding the upcoming Simpsons movie! Got a hot news tip? Send it to simpsons@rubbercat.net! A top secret source over at Film Roman just sent us these EXCLUSIVE, never-before-seen storyboards of some rather climactic scenes! For those of you unfamiliar with animation lingo, Wikipedia defines a film storyboard as "essentially a large comic of the film." If these storyboards are any indication, we're in for a treat! 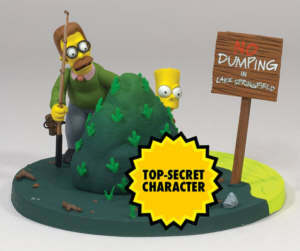 Wondering who or what the top secret character in an upcoming Simpsons Movie toy is? Well, wonder no more! Thanks to a goof-up over at FAO Schwartz, the "top secret character" has been revealed! Just scroll down to see! It's the Amendment-To-Be from "The Day The Violence Died!" An inside source over at Gracie Films has provided us with this hithero-unseen framegrab from the Simpsons Movie! As you can plainly see, they're going with CGI backgrounds (boy do they look great) and more realistic-looking characters (just check out Lisa!). We'll be sure to bring you more exclusives as they occur! The family vacations in Alaska, where Homer partakes in a dog-sledding race. 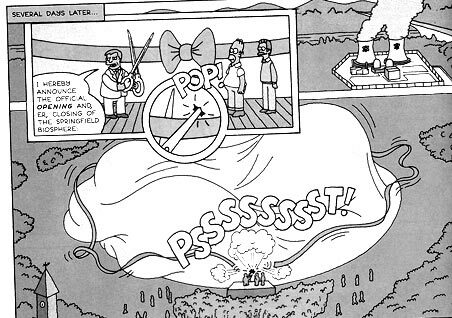 When they come back to Springfield, Professor Frink invents a device that removes peoples clothes and he tests it on bart (That's why bart is skateboarding naked in that one part) The clothes removing device takes up so much power that Mr. Burns decides to cut off the towns supply of power. Fearing for Barts soul, Ned Flanders decides to take him in but The Simpsons don't know that so they replace him with a pig. Bart is mad so he decides to steal the pig during church. Trying to woo back Bart, Homer buys a motorcycle but the motorcycle belongs to the president and all these government helicopters start tracking down the Simpsons. Also Mayor Quimby constructs a huge wall to keep out mexicans. 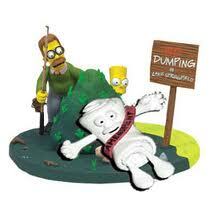 God talks to the simpsons and He tells Homer to fill a silo full of pig crap and homer dumps it in the water. Actually God told him to build an ark but he misheard him. When the town finds out they hang homer. Lisa gets a boyfriend. Hey rubbercat.net/simpsons! "TarantinoFan#1" here with an exclusive f****** review of The Simpson Movie! Iwas lucky enough to see it at the Portland test screening. Alright, first things first: is it funny? You bet your sweet a** it's funny! The whole f***ing theater was rolling in the g*d*** aisles from laughing tomuch! Anyway they made us sign this big ol contract forbidding us from talking about the plot... so I cant say anything specific, f***** pigs. But let me tell, it's f***** awesome times ten. F*** that, times eleven. It's that epic. Maybe its because im still pumped from grindhouse and 300, but i thought the itchy and scratchy cartoon wasnt as violent as it could have been. I want some f****** gore, dawg! Hey what's up rubbercat.net/simpsons. "Random Task" here with a review of the upcoming "Simpsons" movie. I can sum up the movie in three words: lame, lame lame. Now, now, I know what you're thinking. But hear me out. First of all, it basically felt like 3 episodes stitched together. Which by itself isn't a bad thing, but movies are supposed to have flow. After an excruciatingly long first act that rehashes all the usual family antics, Stewie finds a man on TV that bears such a resemblance to his own uniquely football-shaped head that it spawns the hope that the mystery man, and not the dimwit Peter (also voiced by McFarlane), may be his actual father. He embarks on a cross-country journey with family dog, Brian (McFarlane) and local letch, Quagmire (McFarlane), to find him. This second act is the most on-target with humor. The jokes come fast and furiously out of the part of McFarlane's brain that comes up with the most random associations and bizarre situations one could imagine. Once they catch up with the mystery man, there is a fun twist as to his relation to Stewie, but the proceedings slow down again until the frantic last few minutes. The finale includes a direct tribute to "Ferris Bueller's Day Off", which is fun, but as it stretches on, it simultaneously shows that they are having a difficult time keeping enough material to call it a "movie" release. The style of humor is consistent with any episode, and it seems that McFarlane is still the driving force behind the show. However, this kind of humor works best in rapid-fire or hit-and-run doses, and here everything is dragged out, like a telescoped punch. This feels like a single episode overextended, and one can almost imagine the studio execs looking over the writers' shoulders and saying, "Make it 90 minutes! More! Longer! More! Longer! More!" Of course, that's just speculation. Continuity: Smithers is black throughout the film. Errors in geography: There are no states that are bordered by Ohio, Nevada, Maine and Kentucky. Incorrectly regarded as goofs: The characters all have four fingers. Anachronism: The film is set in 2007, but Bart is the same age he was in 1989. Factual errors: God does not exist. Continuity: When Homer meets with the governor of Alaska, her position on the Bridge to Nowhere changes from shot to shot. 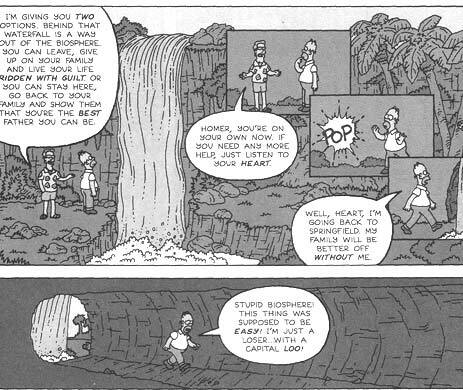 Plot hole: There is no way the Simpsons' house could have fallen into the sinkhole without it being an inside job. Factual errors: Spiderpig is not a spider. Anachronism: It is chronologically impossible for Mr. Burns to be Mrs. Krabappel's son. Crew or equipment visible: An animator's hand is visible during the Milhouse montage. Continuity: The dome is gone when the Simpsons return to Springfield. 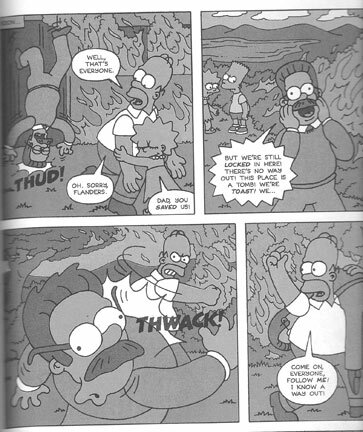 » The movie was originally supposed to be filmed in live-action, but they just couldn't get Marge's hair to look right. 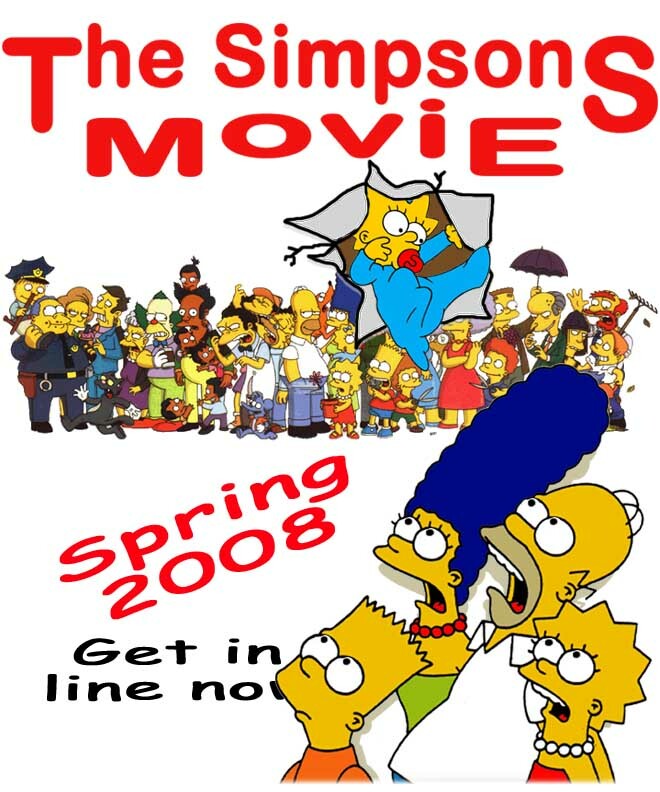 » To prevent leaks during production, producers used the fake title "The The Simpsons Movie." » The script went through 1 draft. » To save money, the second half of the film is comprised of footage from the series. 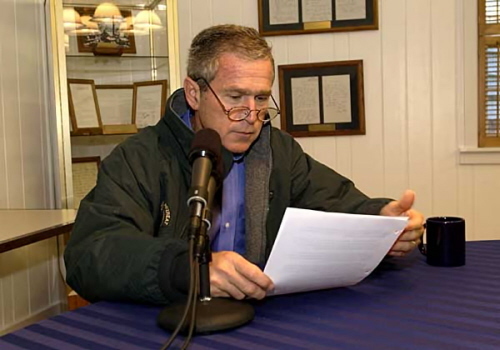 » George W. Bush's dialogue was originally intended for George H.W. Bush, as the movie was written in 1991. 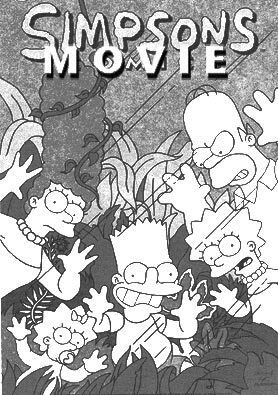 » The Simpsons Movie is the first animated film to utilize computers. » Stanley Kubrick, a self-avowed "Simpsons nut," was slated to direct the film, but his untimely death in 1999 prevented him from doing so. » As part of the marketing campaign for the film, 12 Chuck E. Cheese's locations across the country were rebranded as Wall E. Weasel's. » Marge does not speak until the end credits.